A friend had a saying that I had to think about for a while before I understood it: Perfect kills good. We’ve all done it. We envision something in our minds that we think about, mull over, tweak and finally we can see the perfect – whatever – in our mind’s eye. With a great deal of excitement we swing into action and set about making it. Unfortunately the materials aren’t quite what we thought they were going to be. The colors are not the shades we need. The process goes awry and we struggle to get it completed. When we do finally finish it disappointment sets in. The reality simply does not measure up to the vision of perfection we saw in our minds. We brand ourselves a failure, or at least the item, and that disappointment in our lack of perfection can cause us to overlook the fact that we may have attained a high level of excellence. No one can dip into our minds to see that vision of loveliness that we dreamt of bringing into reality. They can only look at our actual results. Sometimes those results are very good indeed, but because we are so caught up in our perfect project we cannot see what someone else sees. As creative people we must learn that perfect is not a destination that many will arrive at. While we always strive towards that vision we also have to learn how to appreciate what we have made. We need to learn to look beyond the original creative impulse in order to see – really see – what we have accomplished. In a way that lack of achieving perfection is what keeps many people creating. Accepting that nothing – or at least very little – that they make is going to measure up, they acknowledge that and carry on. They learn as much about their equipment, materials and what works in terms of design and keep trying. Every project then becomes a lesson learned. Another brick in their foundation of knowledge. I had a mentor who always said that if we aren’t making mistakes we aren’t learning. If we continually keep doing the same things over and over so that we wind up with a ‘perfect’ project, we are not pushing our boundaries. We are not learning anything new. 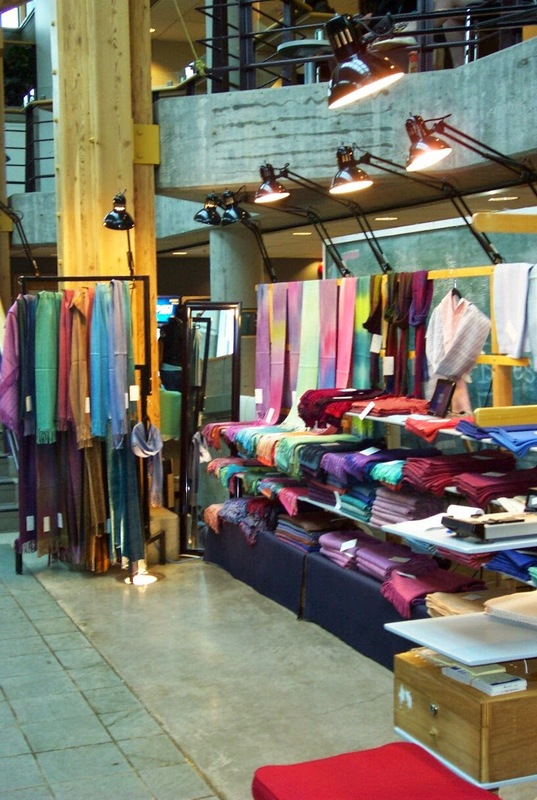 Most of the traditional crafts have developed over millennia. Human beings have been making things, primarily from necessity, but also from a sense of beauty and wonder. When I see archaeological artifacts in museums I marvel at the time and effort that went into making everyday objects – baskets, pottery, metal tools – as beautiful as possible. Some of these things are not perfect. They have their maker’s marks on them in one way or another. But from our perspective, they don’t have to be ‘perfect’. We have the time and distance to accept them for what they are. When disappointment threatens to make something you’ve made in danger of hitting the garbage can, it’s a really good idea to stop. Put the item away, out of sight. Let it rest in sanctuary for a few weeks or even months. Then after some time has passed and the memory of that perfect vision has faded, bring it out again and take a long look at it. See it for what it really is, not what you had hoped to make. Look for what is right about it, instead of what is wrong. Learn how to recognize when something is excellent or even just good. Don’t let perfect kill good. Or your creativity. I wrote this for Craftsy but it was turned down because they already had a similar post previously published. I think this sort of message needs to be seen - sometimes repeatedly - before it sinks in. And not everyone reads every blog post, surely? So, here it is, even though I've written about it here previously. I think I posted this photo once already but it pretty much shows everything that needs to be seen. 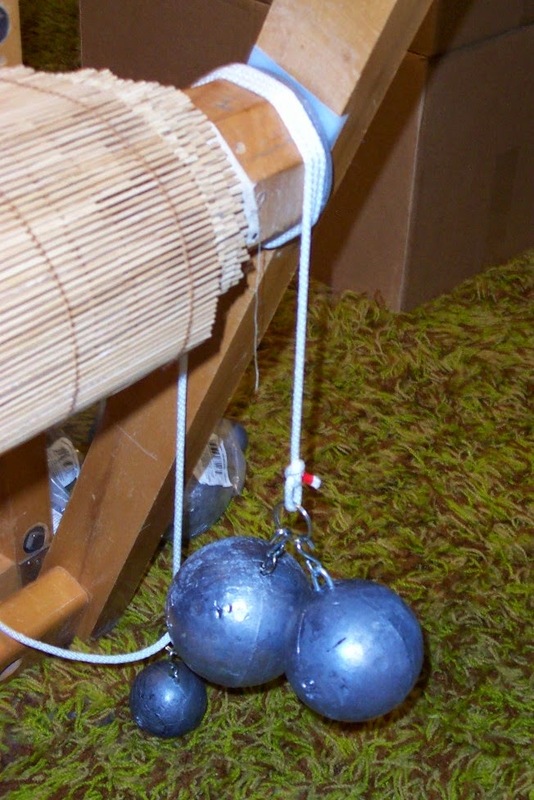 The live weight tension system is simplicity itself. One long cord, long enough to wrap around the beam three times which will support the weight of whatever you use to provide the tension (via the weight used) plus a small counter weight on the other end of the cord. 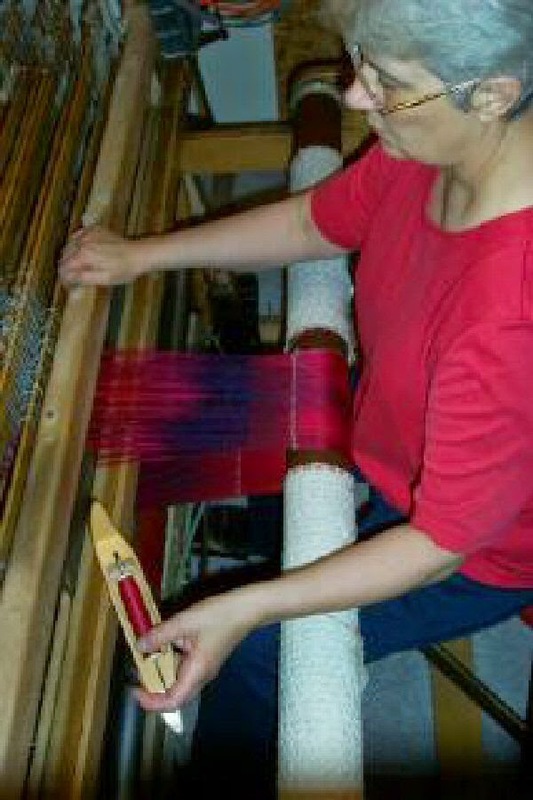 My loom is just 36" weaving width and I rarely dress this loom full width so providing tension on just one end is fine. 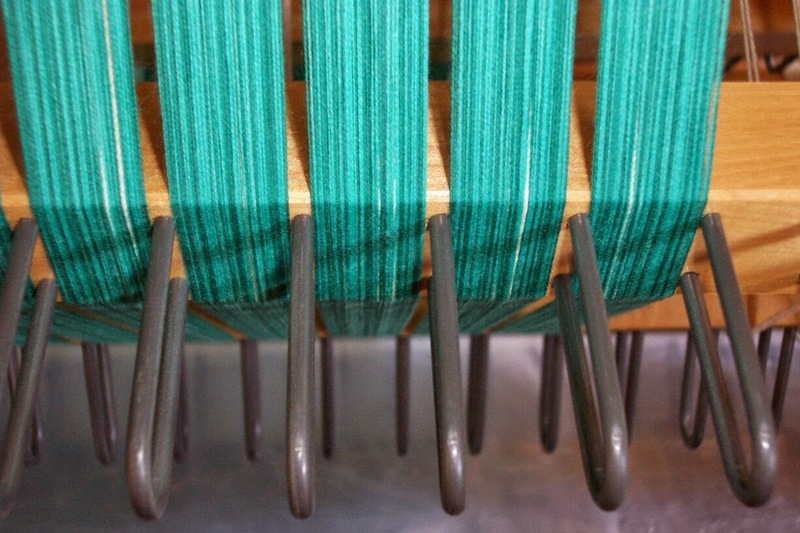 A wider loom might require the weight at either end to make sure it stays put. Kati Meek has published a monograph on this tool and the warping trapeze (as she calls it - same idea as my warping valet) so do buy her book to get the details. The original brake has not been removed from the loom because when I'm beaming a warp, I need that brake to keep the warp rolling on with good tension. 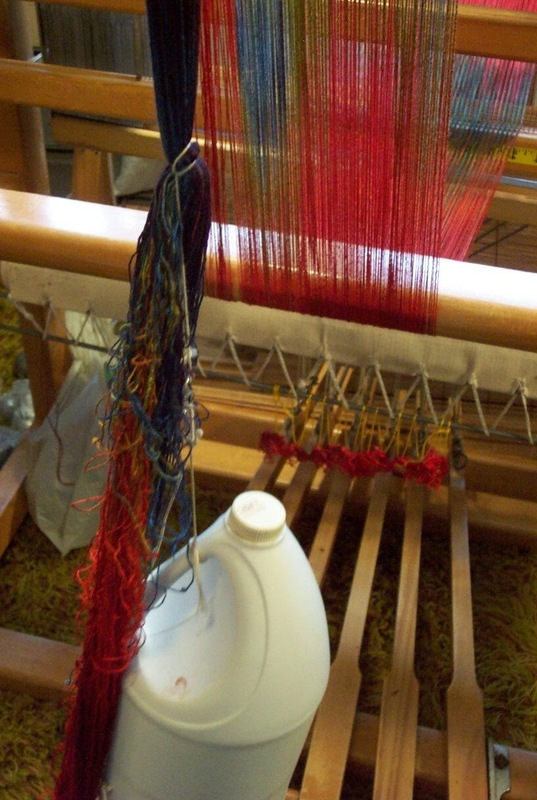 Once the warp is dressed, the cord gets wrapped around the beam, the weight applied (in this instance 25 pounds at the heavy end, 2 pounds - I think - it might only be 1 pound as I was tweaking the system over the weekend), lock the loom's brake system in the 'off' position and away you go. At the moment I'm weaving scarves which don't require a whole lot of weight. If my warp was wider or required higher tension such as place mats, I would add more weight to the cord. Up to 40 pounds, according to Kati. The counter weight needs to be sufficient only to prevent the heavy end from sliding down - gravity, you know? The AVL has a type of live weight system so I'm used to the warp beam 'rocking' as I open the shed, but if you've never experienced that, you might find it a bit off putting at first. This is normal! It's not unlike the Louet beam that rocks - a little disconcerting the first time I wove on one, but you do get used to it when you realize it's not a bad thing. Quite the opposite in fact. 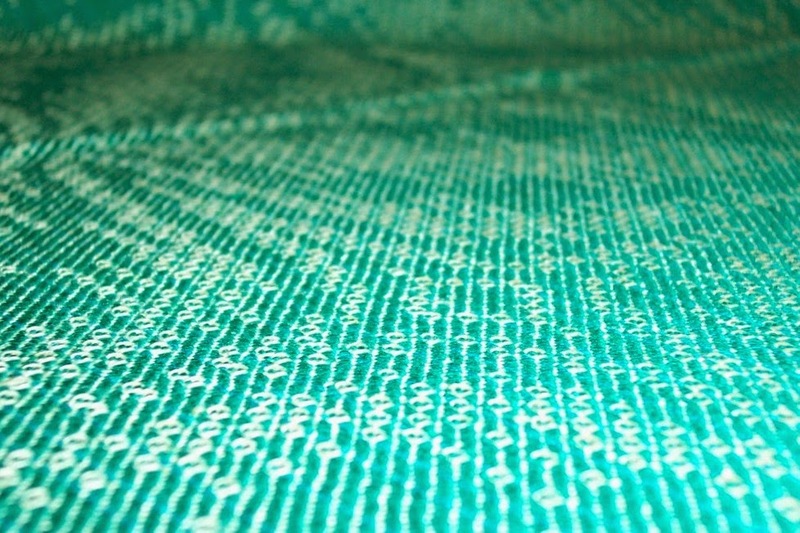 There is less stress on the warp yarns when the system has a little 'give' in it. The big thing is that I no longer have to reach out to the right with my foot and depress the brake release. With the beginnings of arthritis in my right hip, I needed to reduce the stress on that joint. And once the tension is set, all you have to do is just crank the fell line forward - the tension will stay the same from one end to the other - unless the cord gives way or something. But as soon as you put the weights back onto the cord, you're back to where you were. Automagically, as it were. Messed about a bit more with the camera today. I think the top picture, which shows a bit more of the cloth in the background, is better than the bottom one, which is too out of focus. Neither one really captures the cloth as cloth, though. Going to have to play around with this more. 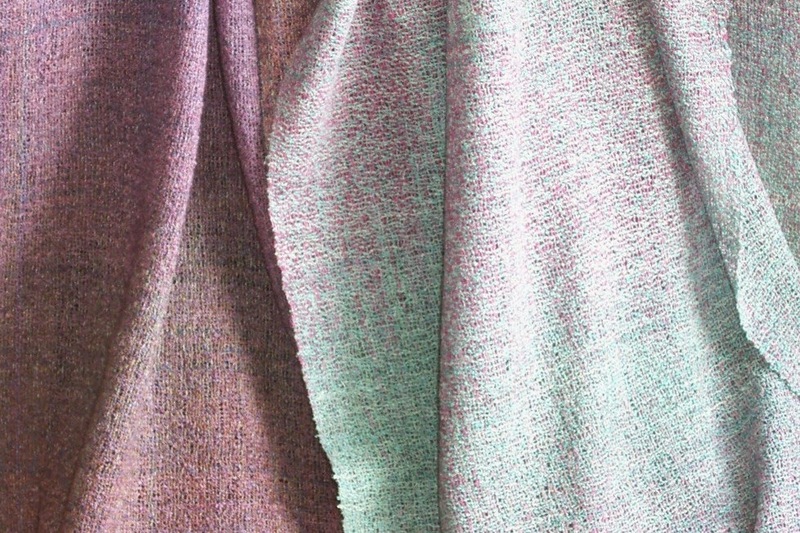 I think one of the best books I've seen which really seems to capture the nature of the fabric in it's photos is Jack Lenor Larson's Material Wealth. Friends gave me the book when I got the master level of the Guild of Canadian Weavers certificate and while that is a very long time ago I still have yet to actually read the book. I open it and start turning the pages, sucked in by the exquisite photos. I think I need to pull that off the shelves again and take another look. For those of you who have purchased the dvd's I did with Interweave Press, and you think they are worthwhile, I would really appreciate your passing along the word to your guild mates, on the internet (including posting a review to the Interweave site), etc. I realize that the dvd's are not comprehensive - how can they be in a 70 or 90 minute time frame? But hopefully they will be useful. Doug has done some more tweaking to the loom and I'm dressing it with another painted warp for scarves so I can double check the live weight tension system, which also seems to need a bit of tweaking. I had wrapped the cable in one direction and found that it was creeping towards the warp. Which would be okay except that when it got to the apron rod, the rod would get wound underneath the cable and then dump the weights off - which was kind of counter productive. So I'm going to wind the cable on the other direction and see if it will stay put. If not I might have to get Doug to put a higher flange on the warp beam at that end. I had thought there were only four painted warps left but discovered this 'parrot' coloured warp in a box - obviously way back in July I had started to get it ready to be woven and then the box got shoved in a corner and forgotten. I won't get all five warps woven, never mind fringe twisted or wet finished, but I'm hoping to at least get this one done. I'm low on inventory of 'true' reds so adding a bit more breadth to my inventory would be A Good Thing. And Meg has issued a challenge to take really nice (beauty shots?) 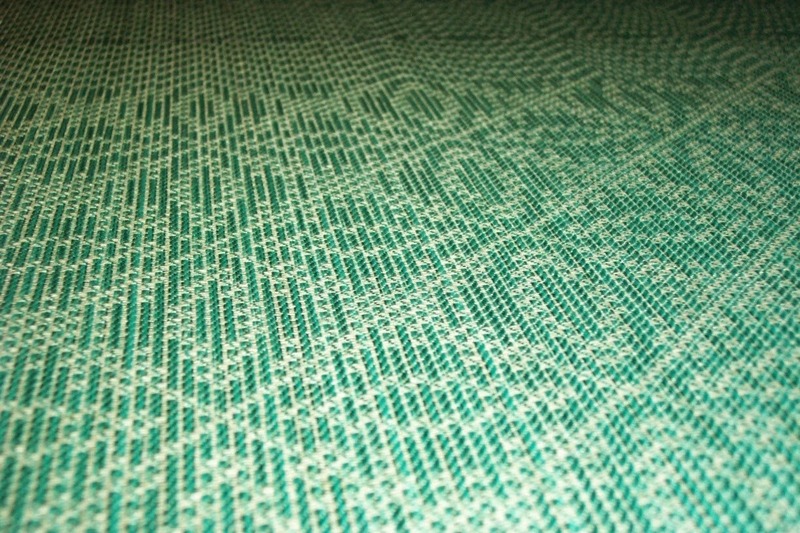 photos of textiles so I tried getting a good shot of my tea towels this morning. Since this photo was to be for several purposes, I think I did okay. What do you think? 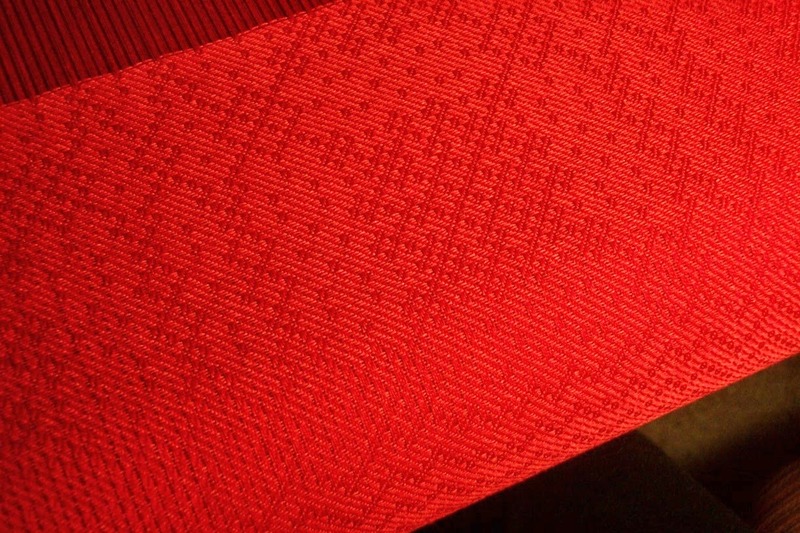 Getting a good picture of this cloth is a bit of a challenge - red on red? Especially on the loom. But I think it's looking good, and it's weaving up quite nicely. this afternoon and evening I managed 3.5 towels. I think that makes me 1/10th the way through this warp. I need to do some weaving on the small loom, too, though, so tomorrow morning I will probably dress another painted warp for scarves on that, then do the final tweaking (or at least I hope it will be the final tweaking) of the live weight tension system. We'll see if I get back to the AVL tomorrow, or not. And it's out! 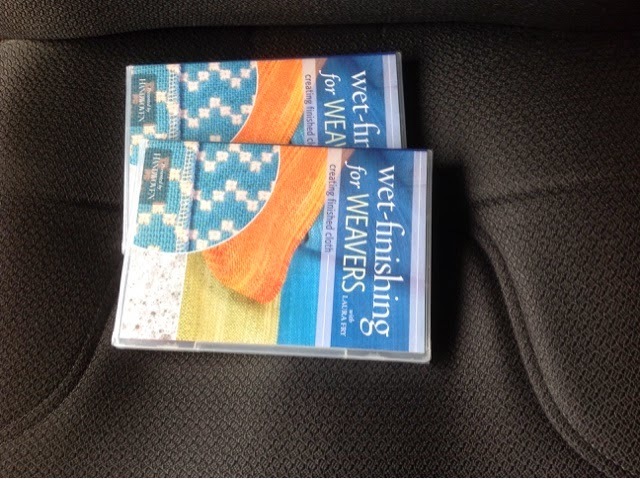 The Efficient Weaver DVD was launched today at the Interweave Press store. 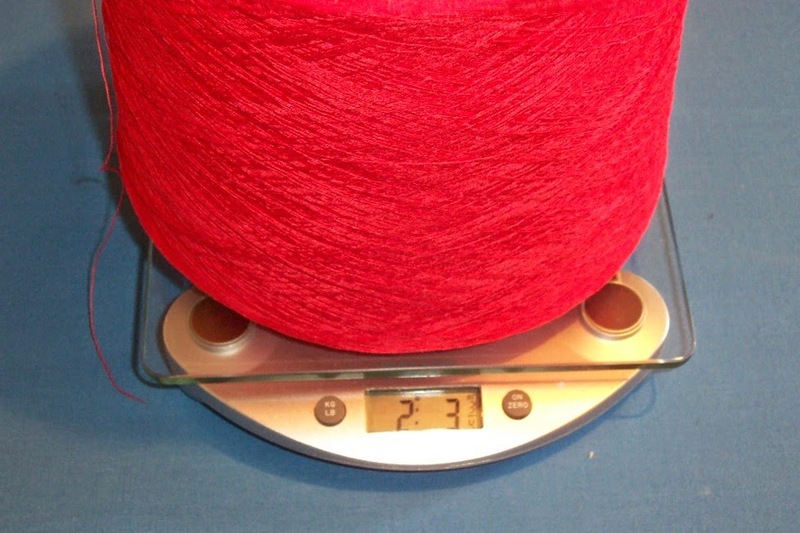 There is enough of the 2/16 red cotton to beam a 36 yard long 25"/section warp. 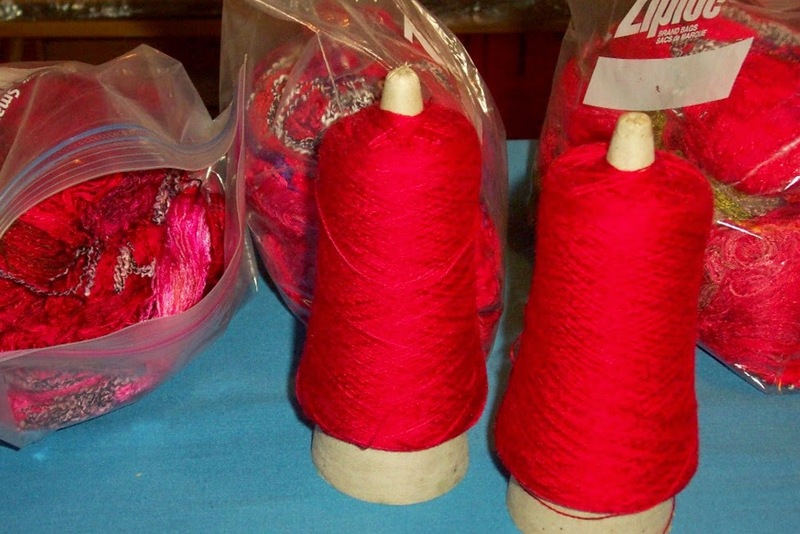 That won't use up all of the red cotton, but I'm hoping I won't run out, either. Whatever little dribs and drabs left will get donated to someone who can likely use it. 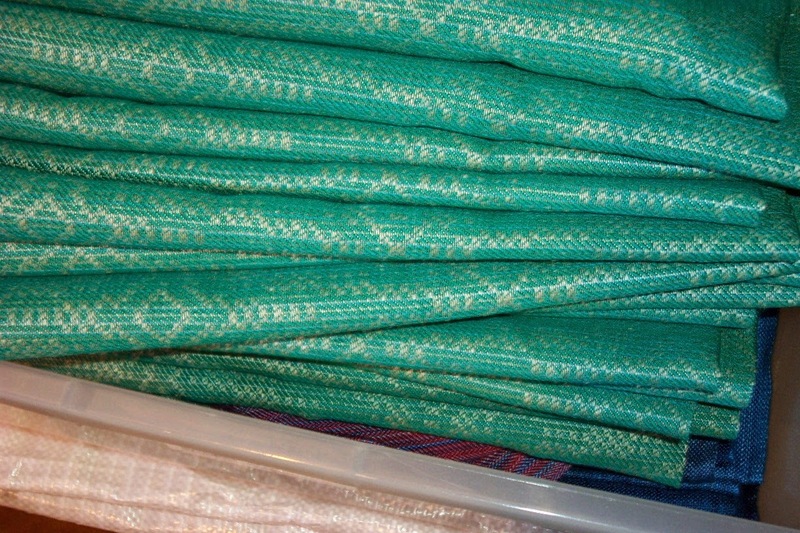 Any tubes with any kind of length left on them will be kept to use as accent in other warps. Or eventually given away as well. When I was teaching, those tubes would be used for workshops. Now that I'm likely 'retired' from teaching I will either have to use those dribs and drabs up myself or pass them along to others. 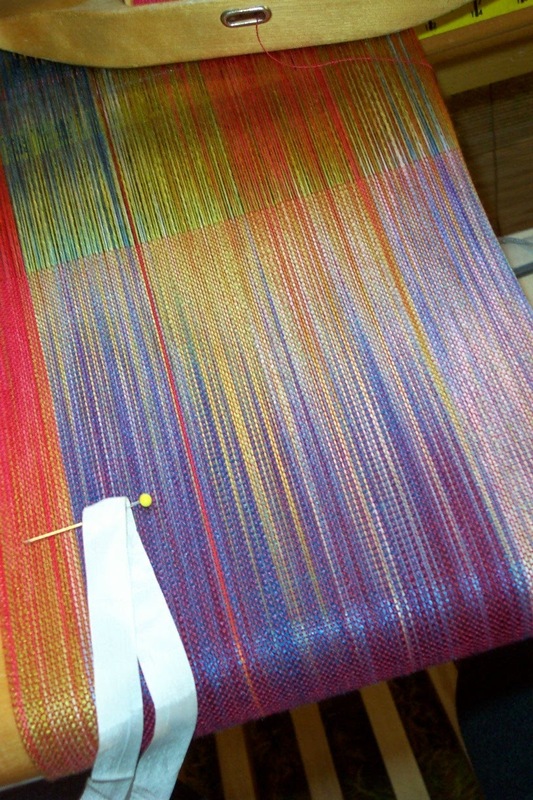 The goal is to finish this warp today so I can beam the next (red) warp tomorrow. Or at least get started on it, in between the myriad things that also should be done tomorrow. I think the concept of Thanksgiving Day is a good one. So good that I try each day to find something to be grateful for, even when things are not going well. Sometimes it's being grateful that things aren't worse! Over the summer and my recent health issues it was getting very hard to find those small blessings and receiving these lovely towels as a hostess gift from Cindy touched me deeply. 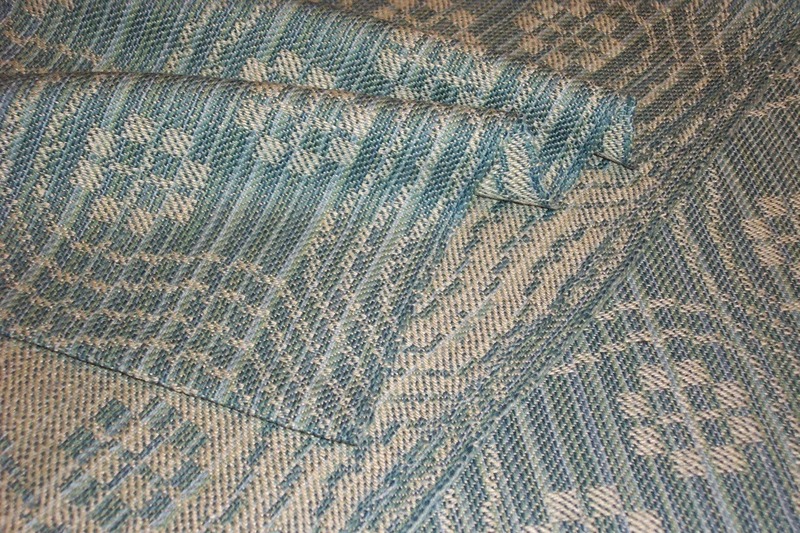 Woven on the same warp with two different weft colours makes them siblings, not twins. 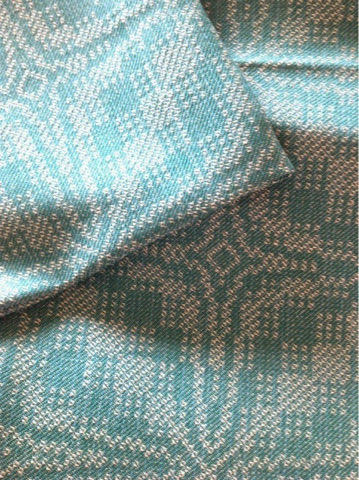 I love having textiles woven by other people. We have quite a collection now of tea towels and each time I pull one from the drawer to use - because I do use them! - I remember the person who made them, which brings them close, as though a little of their essence has come to live with me. So today I will remember all the things I am grateful for. The sun is shining after several days of cloudy windy days. The season is waning and winter is approaching but for now we have a lovely autumn day with a little colour still on the trees. The gusty wind yesterday took more of the colour down and rain is predicted for the coming week. I still enjoy the roll of the seasons as the days go by. Even if the winters have been dark and dreary for the past few years. The cold and short winter days make the summers all the sweeter, I think. If every day was perfect, a lovely day would be less special? Or perhaps not. Thanksgiving comes earlier in Canada than the US. I think the distance from now to Christmas helps make each 'holiday' a little more special, although that may just be because I was raised in Canada and it has always been this way for me. Today we will take mom out for dinner. Neither of us feels capable of cooking a big meal. I'm content to have someone else to the cooking - and even better - the cleaning up! We will have a quiet appreciation that we are here, still able to feel gratitude. It's been a challenging time for us since my brother died in 2008. But I'm still here, so I guess that means there is more I need to do, something still to accomplish? It is the mystery of life. What's it all about, anyway? I don't know. I just know that I am still here, still able to weave, maybe even help other new weavers to a better understanding the the craft. Autumn is well advanced now. 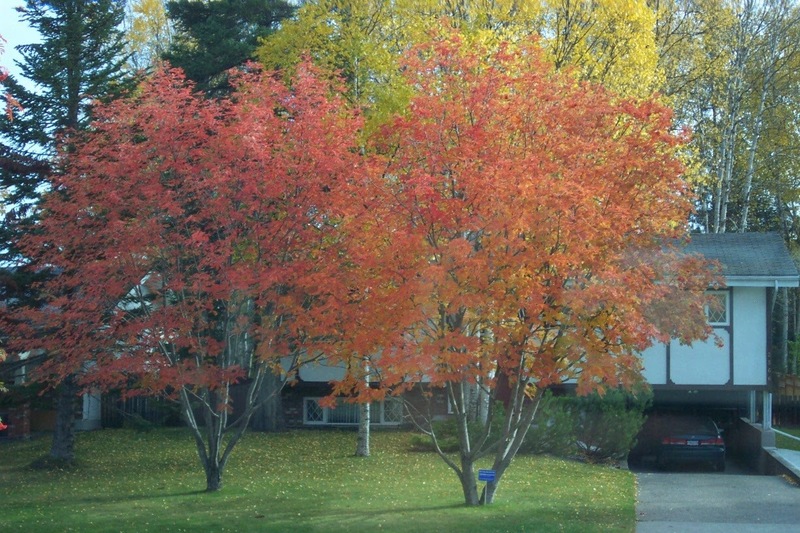 Many of the trees have dropped their leaves, others are still showing some colour. Nights are getting chilly. It is the time to get winter tires on the vehicles - hopefully in advance of the (ahem) white precipitation! It is also getting very close to show season. Once Doug loads the van with the show stuff, it will stay in the van in between shows until we are done. Just four shows this year - two here in Prince George, one in Vancouver, one in Calgary. And then a tiny show in the guild room. Must remember to make up flyers to advertise that, too. 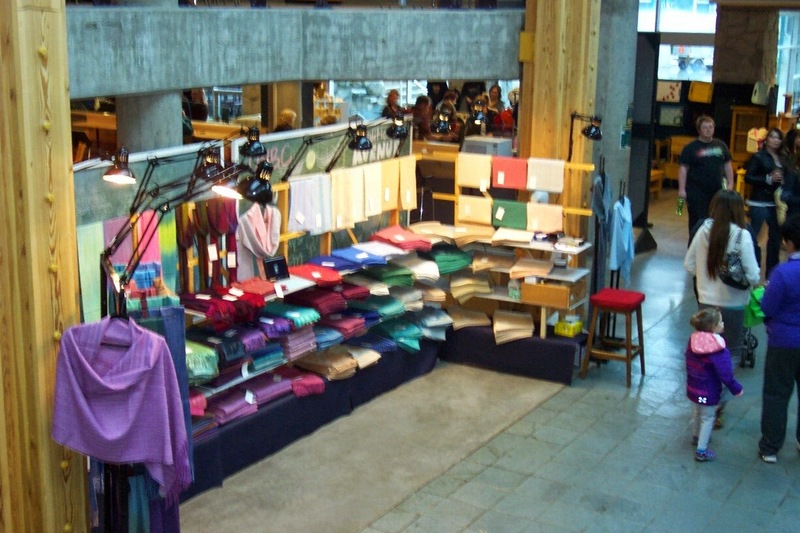 The guild has received a large number of donations the past two years. 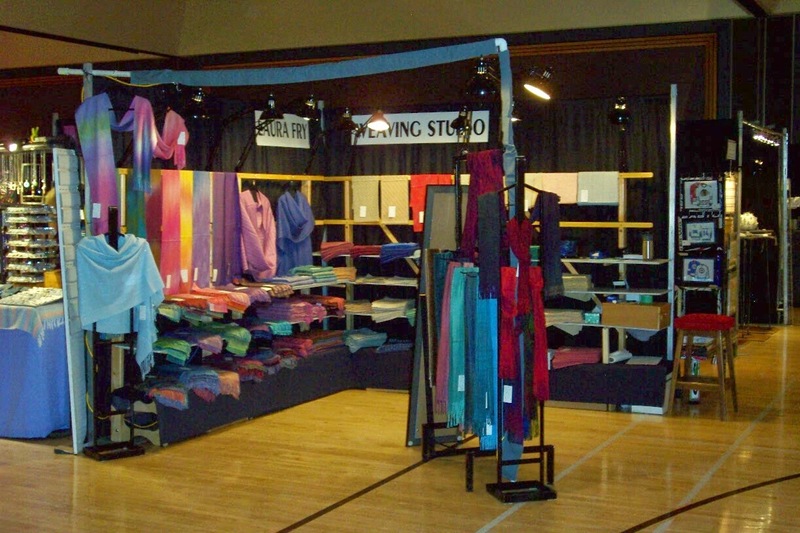 Older guild members are passing on to the big weaving studio in the great beyond and leaving their beloved stashes behind. It all makes me even more determined to re-establish some sort of functionality and use up more of my stash! But I'm not quite there yet. I'm continuing to take things 'easy', exploring the new boundaries my health issues are imposing on me. I'm hoping to gently ease back into some sort of routine, although the show season will interrupt that as we get busy with packing, unpacking, doing the shows. In the meantime I'm continuing with transcribing interviews, picking away at the 30 yard warp on the AVL and tackling the latest hemming pile. Surprises in the mail today. Well, I knew the bobbins were en route but I had forgotten. Memory is good, just very short. Which kind of explains the magazine. There is such a long lead time that by the time the magazine actually comes out I have forgotten I wrote the article. So, receiving both of these things in the mail today was a pleasant surprise. Thr bobbins are for bobbin lace and my friends who make them. Will soon be retiring. Not that I don't have oodles of bobbins! But it was fun to see what she would come up with for themes. 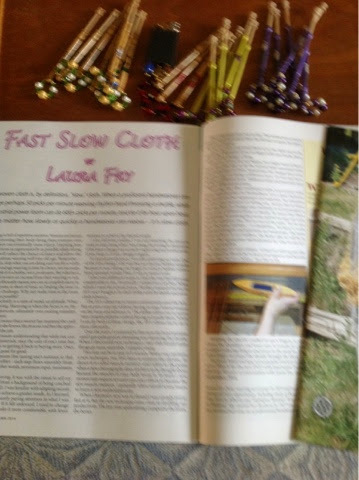 The article is in the Ontario guild publication, Fibre Focus. Doug got up to the annex yesterday to work on the pressing. Tonight I will trim the 21 scarves and then they can be tagged and priced and put into inventory. And once again, the hemming pile awaits. So, here is the next warp. It's not perfect. You might just be able to make out the mistake I made when generating the threading for this. Seems my pain fogged brain wasn't really up to the task. As I threaded yesterday, I came across a discrepancy - a doubled block. When I checked back at what I had already threaded, I found the same error in the same position of the repeat. And decided that since it was repeated it was symmetrical, since very few people would even notice it and it certainly did nothing to affect the functionality of the cloth, I wasn't going to take the time to fix it. Instead I have a unique interpretation of the Honeysuckle overshot, transformed to twill blocks. 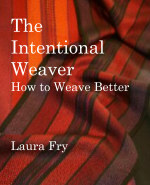 My focus as a weaver has always been to make functional textiles. I try to make them as attractive as possible. But I'm not perfect. I make mistakes. I have bad days and make bad decisions. 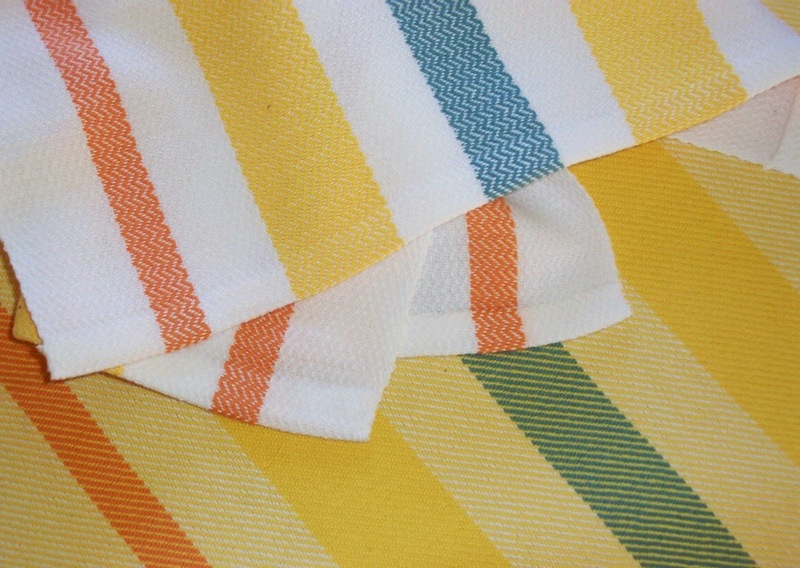 But I also know that this is a tea towel, the error is minor and, as I say, most people won't even see it. So I am not going to allow my Inner Critic to ruin the fact that the tea towels are pretty (*I* think) and they will perform perfectly fine. I will not let my Inner Critic diminish the enjoyment I'm having from finally being able to weave again. None of us are perfect. But we can still be of service. I have two copies of the DVD that I can use for reviewers. If you have a blog, or are willing to review the DVD on the Internet, guild newsletters, and/or social media, the first two people who email me at laura at laurafry dot com will receive a copy. 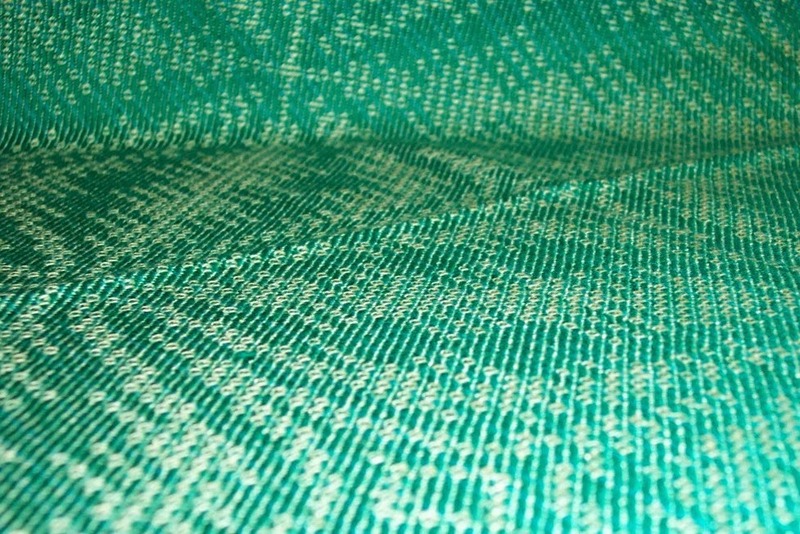 This morning I finally finished the Blooming Leaf warp (twill block version) and cut 17 towels off the loom. 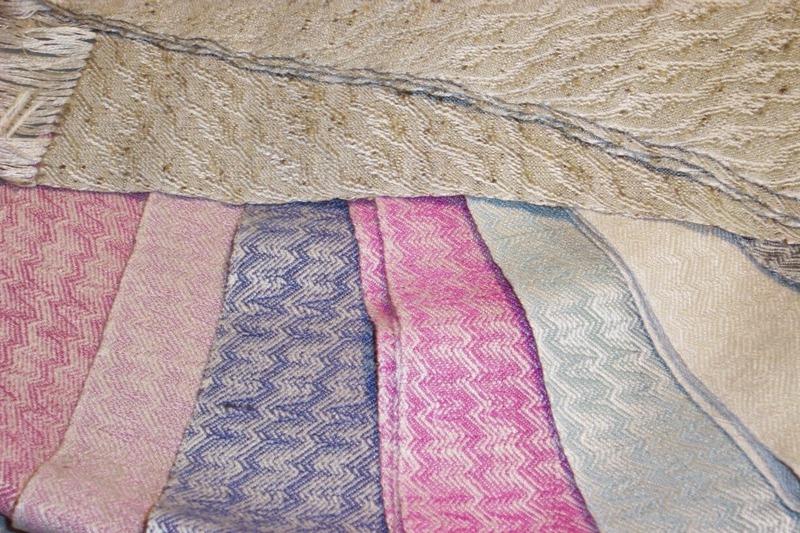 They were added to the stack of 21 scarves also ready to be wet finished, thanks to my fringe twisting elf. Now to find out when Doug will have time to go pressing. The show season begins in just two weeks so everything that I can get done needs to be done very, very soon. This summer has been enormously difficult. For the past six years I have been facing one health 'crisis' after another. Every time I have successfully navigated my way through the current shoals, I feel positive that having two, three, four chronic conditions is surely enough for any one person? My optimism really took a beating over the latest. I'm not in my 30's at the beginning of my life. I'm 64. My body is aging. I am beginning to understand that things will not necessarily get 'better'. My best hope is to maintain where I am for as long as possible. It has meant a radical shift in my thinking about what my life is all about. What I can do. And what I might no longer be able to do. However, there were several 'positive' things that came out of the latest experience. And I am going to have to hold on to that thought. Thing is, the path of life is not smooth. It is rocky. It has detours. It sometimes seems to meander in directions you really, truly do not want to go. But that's life. It's my life. The best I can do is try to enjoy the journey. It is the human condition to have challenges, heart ache and great joy. Everyone, so the saying goes, is fighting a great battle. If we cannot be kind, at least let us try to do no harm.